A great day out in the west of the island with a massive count of bird species spoilt only by the persistent strong southerly winds. Our destination was the picturesque village of Sigri and the surrounding countryside, we travelled from Skala Kalloni through the mountainous centre of the island passing through Dafia, Filia, Skalachori, Vatousa and Andissa. This long and winding road took us through some stunning scenery as well as the beautiful villages listed above. Our first stop was in the Lardia Valley, a steep sided canyon with high rocky outcrops and a wooded valley floor, the potential for some great montane species was an exciting prospect. However, the wind was quite blustery here and very little bird movement was noted, a small number of Crag Martins flew around us, a brief view of a Rock Sparrow and distant views of Blue Rock Thrush and Black-eared Wheatear was all we got. The journey towards Sigri continued and just past Andissa we made a quick stop to look at a bird perched below the road on a dead twig, it was a Cinereous Bunting, we had time to take a few pictures before it flew off. At the Eresos Crossroads we stopped to look for Isabelline Wheatear, this bird breeds on the island in a very small area but it is locally common. We saw one as soon as we got out of the bus, a male was displaying in flight, it went up several times whilst we were there, a female could be seen on top of small bushes. The visit to Ipsilou was a waste of time really, the wind was so strong it was hard to stand up in some places. We did find a couple of sheltered spot but not much was about. The monastery sits on a wooded pinnacle high up in the mountains, I dropped the group at the very top and rove the bus back down to the base car park. They walked down the lea-side and I walked up to meet them half way. A Wood Lark posed nicely for the cameras, we saw a Raven’s nest with three fully grown chicks and a couple of Cirl Buntings was all we got. A single Cinereous Bunting sang from a tree-top but we only saw it flying off. Sigri osca beautiful little fishing village sheltered from the sea by a large island forming a natural little harbour, it was nicely sheltered from the wind at the harbour-side so we stopped for a coffee. Large flocks of Jackdaws flew to and fro across the water and a few European Shags were seen too. For the rest of the afternoon we explored the tracks and trails in the Sigri fields and Faneromeni area, we visited both the Upper and Lower Fords, the beach area and the fields beyond the Upper Ford, it was a great afternoon despite the windy conditions. 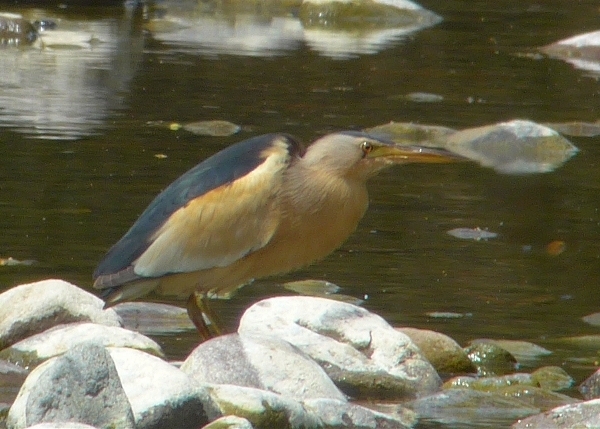 Viewing the Faneromeni river from the upper ford produced a number of species, the best of which was a Little Bittern which came right out into the open and fed on tadpoles. 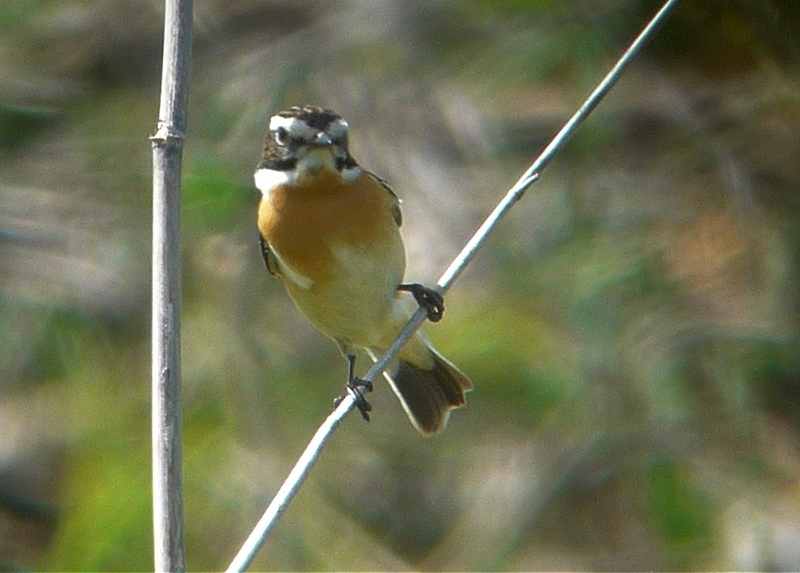 We also saw Common Redstart, Blackcap, Reed, Great Reed, Cetti’s and Sedge Warblers as well as the ubiquitous Wood Sandpiper and Black-headed Yellow Wagtails. A Honey Buzzard was a great find it landed briefly far down the river on the shingle bank but only a few of us saw it. 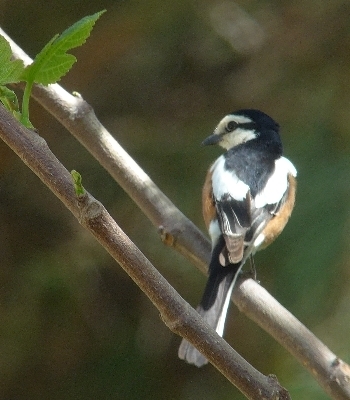 Our walks produced a good number of shrikes, many Masked Shrikes and fewer Red-backed and Woodchat Shrikes with a single Lesser Grey Shrike, we also saw a few Whinchats and finally we found a Flycatcher, it was only the Spotted variety but it my first for the year. The sky was always full of swallows, swifts and martins, we added Alpine Swift to our list and we had good views of two Eleonora’s Falcons, a lovely Montagu’s Harrier, Short-toed Eagle, Common Buzzard and Lesser Kestrel. The wind eased a little later in the afternoon but not by much, a quick sea-watch produced sightings of a number of Yelkouan Shearwaters and a couple more European Shags. Our drive back along the track through the Sigri fields produced our best sightings of the day according to the group. We stopped where a number of people were scoping a field and to our great delight they were watching a Roller, it was bit distant but it looked great in the afternoon sunlight. 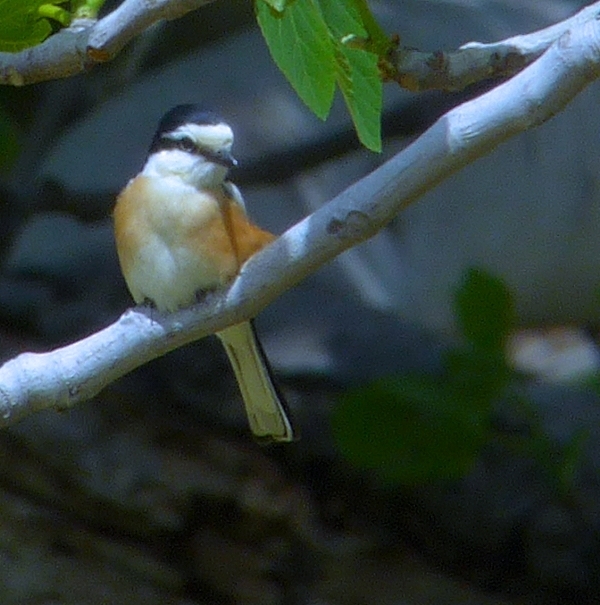 Then we found a second one much closer and behind that a bush held 6 Bee-eaters and a Red-backed Shrike, marvellous! 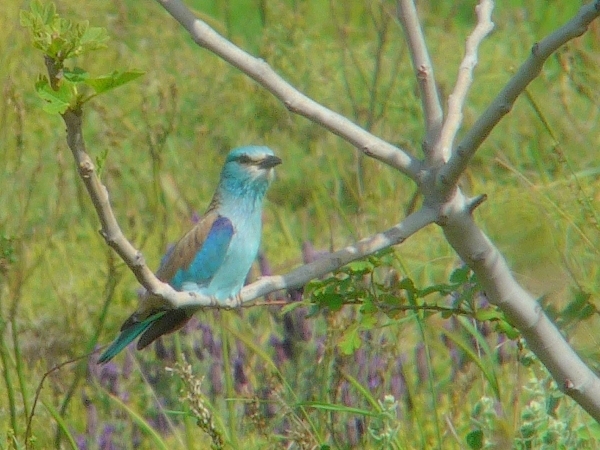 A great way to end our visit, we got great pictures of the Roller. After an hour’s drive we were back in Kalloni and before we went back to the hotel we decided to try to find the elusive Spur-winged Lapwing at the Kalloni Salt Pans without success. We ended up in the hide looking out over the pans in the south-east corner, the evening light was lovely and we saw a great many species including 3 more trip ticks, they were Eurasian Spoonbill, Ringed Plover and Black Tern. We really enjoyed that last hour and as the sunlight began to fade the colours changed and many birds came to roost in the safety of the large pools. We counted over 100 Ruff, 60 Little Stint, 15 Marsh Sandpiper, hundreds of Wood Sandpipers, Stilts, Flamingos, Avocets, herons, egrets and terns, smashing!